I know, I know, I know, I KNOW I just posted a slow cooker recipe last week but with Fall right around the corner I have been giving it a workout. Cook up this roast and you can eat off of it all week. I chose to use all the meat in these flautas which I froze to pull out for future lunch box lunches for my daughters. But you could serve it Chipotle-style and throw it in a bowl with rice, beans, cheese, and your favorite taco/burrito toppings. 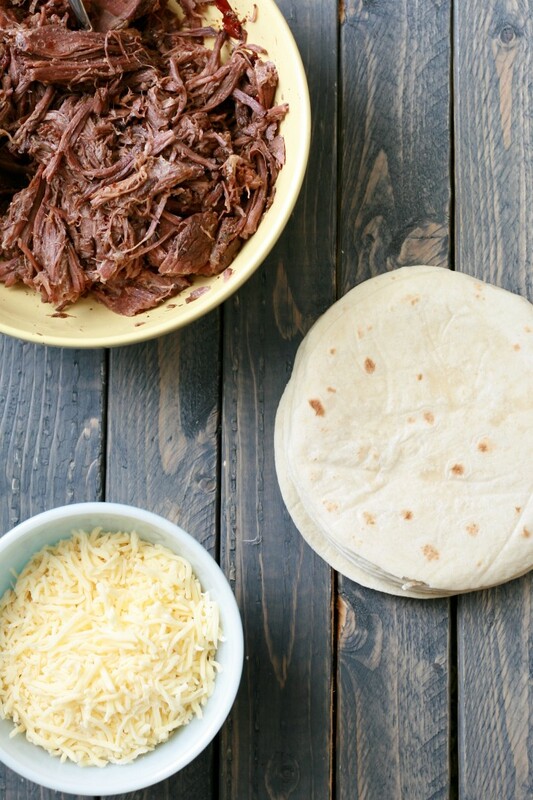 The secret to good barbacoa is low and slow heat. I wish I had a good grill to actually cook this meat low and slow but I don’t have the time or the right equipment to do so. This is where the slow cooker comes in handy. Slow cookers were made for low and SLOW cooking. I still wanted a punch of smokey flavor in my meat so a few chipotle chiles in their sauce helped provide that smokey flavor. They also pack a bit of heat which is nice. If you find the peppers are too spicy for your liking squeeze a lime or two’s worth of juice will help neutralize that heat. This recipe used a 3.5 pound chuck roast, cooked for 10 hours, then shredded with two forks. There was enough meat to roll 20 flautas. I used just a few tablespoons of meat and Chihuahua cheese (read a funny story about that here) in each flauta. When rolled these are about the size of a nice cigar. Warming the tortillas in the microwave for a minute makes it so much easier to roll them up tight. I skipped the fryer and decided to bake them instead. Lightly spraying the outside of the flour tortilla helps give them a nice crispy crunch. What are you waiting for?! Go get your barbacoa on! *note the beef barbacoa is gluten free however my flautas used gluteny flour tortillas. 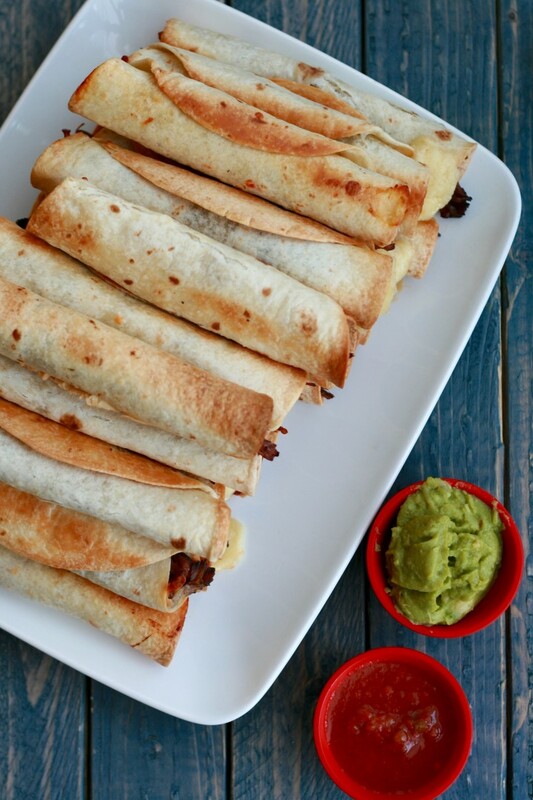 Sub your fave gf tortillas to make the flautas gluten free! You can freeze the leftover chipotle in adobo. Place on baking sheet lined with parchment. Freeze until solid 4-6 hours. Remove chipotle "cubes" place in zip top plastic bag and return to freezer. Once the flautas have cooled you can place them in zip top freezer bag. When ready to reheat, place frozen flauta in microwave and heat in 30 second increments. Usually are warmed through in 60-90 seconds. These sound amazing. I love cooking a roast in the slow cooker all day and adding it to anything, especially something Mexican-ish. Can’t go wrong with something Mexican inspired! Thanks for checking it out Deborah. These look wicked delicious! I can’t have starches these days (even gluten-free ones) but I’ve been thinking about picking up a food dehydrator to make zucchini flour out of. I bet this would be fantastic with homemade zucchini tortillas. I’ll have to give that a shot this week. Thank you for sharing! Zucchini flour?! I am intrigued. Thanks for stopping by Brittany! Wow these look SO good and your photography is AMAZING! Now off to make some dinner for myself because my mouth is watering after reading this! These flautas look and sound delicious, just looking at them are making me so hungry! Yum!! They look delicious! I love any recipe that uses the slow cooker, it makes it so much easier to make something delicious without slaving away in the kitchen all day! I know that if I served these to my little guy he wouldn’t fight me at all! I’ll have to try this recipe out! Thanks for visiting Francesca! I hope the whole family enjoys them. Keep the slow cooker recipes coming! Next month is a no fast food month for me so be prepared to see LOTS of slow cooker recipes! Yummmm! 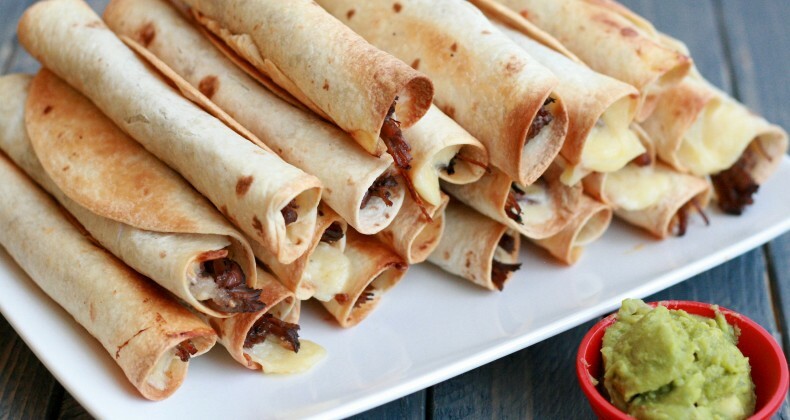 I love barbacoa, but am not the most talented cook, however these flautas seem simple to prep. Thanks for sharing this recipe! These look delicious! Saving this recipe for sure! Thanks Katie. I hope you enjoy. My slow cooker has been my go-to for making meals lately, so this will definitely go into the rotation. It looks and sounds divine. Thanks Cheri! My slow cooker and I are going to BFFs this season so look forward to more recipes. These look so delicious! That meat is juicy, and we love Mexican flavored meals! I need this in my life ASAP. Looks amazing!